The embattled quarterback is often derided as “divisive”—but it’s Ray Lewis who is dividing Baltimore. When you say “Baltimore,” most people in the United States conjure images of the city. Maybe they think of the Orioles, Camden Yards, and Little Italy. More likely, their minds fill with images of The Wire or the police killing of Freddie Gray and the subsequent social unrest. They see Baltimore through the eyes of the nightly news: as a majority-black city defined by urban ills. For Maryland locals, there are two Baltimores. There is Baltimore City, and then there is Baltimore County: a majority-white, politically powerful, middle-class suburb that exists outside and apart from the urban environs. There are few common points of identification between Baltimore City and Baltimore County. One is the NFL’s Baltimore Ravens. That’s what makes the recent actions of Ravens icon Ray Lewis all the more noxious. Over the last week, the Baltimore Ravens have considered breaking the NFL’s glaringly obvious “gentleman’s agreement” to ostracize free-agent quarterback Colin Kaepernick. The team’s quarterback situation is a shambles and Kaepernick could be a godsend for the organization. Yet the most powerful voice in Ravens-land against Colin Kaepernick has not been ownership, coaches, or fans. It has been Ray Lewis. It would be difficult to overstate Lewis’s influence. He is the vocal leader of the team’s only two Super Bowl championships, and there is a statue of the future Hall of Famer outside of their stadium. He is team royalty. His brilliant career also might not have happened had he not received a second chance after facing charges for accessory to murder. According to Sports Illustrated, Lewis has been helping team owner Steve Bisciotti decide whether Kaepernick should be signed—and it’s hard to imagine that he is saying anything helpful. Lewis has been on television and social media arguing, in a highly patronizing fashion, that Kaepernick needs to get away from those “encouraging [him] to be caught up in some of this [anti-racist] nonsense,” saying: “If you do nothing else, young man, get back on the football field.… And what you do off the field, don’t let too many people know.” He has also drawn on his own experience in arguing that Kaepernick needs an image overhaul, equating his murder charges with Kaepernick’s polarizing stance against police violence. None of this is that surprising. It is part and parcel with Lewis’s post-career makeover as the sanctimonious scold of the Black Lives Matter movement. Lewis has remained silent as Trump has said and done nothing about economic development in “urban areas.” He has also remained quiet about Jeff Sessions’ neo-Confederate agenda of mass incarceration, the drug war and anti-affirmative action bombast. The tragedy of this is that Ray Lewis, for all his faults, is uniquely positioned to act as a bridge between Baltimore County and Baltimore City on the question of Colin Kaepernick’s signing. In addition to the football benefits of signing him—again, their quarterback situation is a sewage-filled dumpster fire—Kaepernick would be a terrific and much-needed presence in the city of Baltimore itself. 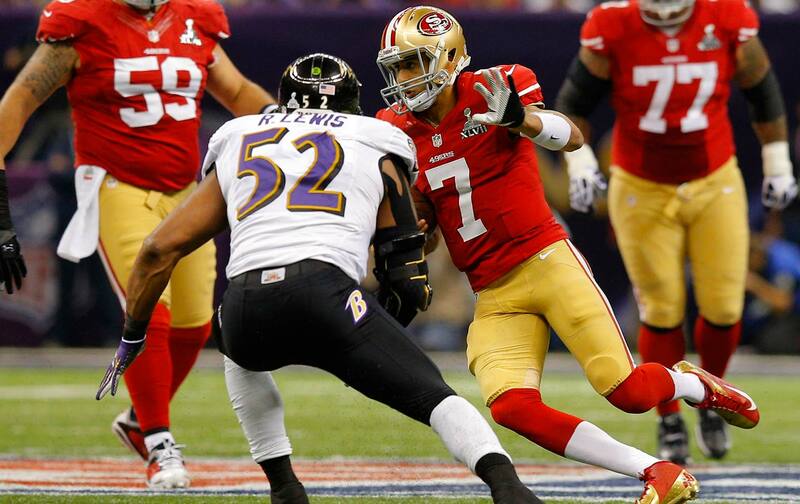 Lewis could be the voice that moves the Ravens-crazy County part of this equation toward embracing Kaepernick. Instead, he’s choosing to enhance his own brand by building walls instead of bridges. Ray has learned well from Donald Trump: There’s more money to make and power to accrue in the business of division than in unity.